"My 16 month old is now the one that inspires me to make jewelry. I had put jewelry making aside for quite some time, but she has been ill her entire life and I started again to help me get through some difficult time... She keeps me going and my jewelry helps keep her and my son close to my heart at all times." Congrats, Paige! To claim your prize shoot an email over to kate (at) beaducation (dot) com and I'll send it on out! Speaking of little birds... Birds + Design stamps = supercute! Wouldn't you just LOVE to win this little bird design stamp? 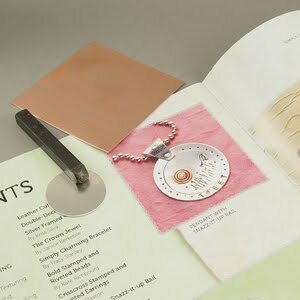 Kate used it for her "Pendant With Snazz It Up Bail" project for Lisa's upcoming book . The winner will receive the design stamp, a 3x3 sheet of 24 gauge copper and a 1 1/2" inch sterling silver blank, along with a promo handout for the book that features a project and photos from the book. To win this one, let us know your favorite design stamp. Or better yet... if you could have anything on a design stamp, what would it be? Either way, leave your comment below. You have until Thursday, April 15. We'll draw a random winner and let you know who won on Friday, April 16. I would love a fleur de lis design stamp. My favorite design stamp is the Loopy stamp, because it can be used on almost any piece of jewelry to give it an elegant look. I would love to have an "i love you" in sign language stamp. The favorite one I have is the swirl. Because I love all things French, I my fleur-de-lis stamp gets a lot of use. PS - Would like a stamp with the Napolean bee insignia. I really like just about all heart stamps. Love the new one I got here that is the tiny heart border with the 2 little hearts and dots. So cute! I really like the look of that bird one in the post. I would love to see a buck (deer head w/ rack) & a hunting bow. I've been a hockey mom for 15 years and even though my son won't be playing hockey after graduating from high school this year; I still would love to see a hockey stick stamp. My wish would be for a small curve with tiny dots to use as a border or as a spray. It could be used both ways to spray in either direction. I love the tiny doodle heart, I have found so many fun uses for it. I LOVE Suzie's idea, I would love to see a little house with a heart window! I love all my heart stamps and my peace sign stamp. I wish for science related stamps, like a DNA helix or a beaker. I ordered the peace sign, and when i got it in the mail it was so small, it thought i would never use it but it is so great! I don't have a favorite yet because I am new to stamping but I would love a baby bird stamp to go with the bird stamp. Lotus is one of my favorite flowers and the meaning behind it plays a big part in my life! I would love a little lizard stamp. You have so many that I like, I love all the spirals especially the square spiral. The shell stamp is my favorite. Using it other than right side up completely changes the stamp look. I think my favorite is the swirly heart....I use it ALLLL the time....but I'm REALLLLLLY wanting a stamp with the @ sign on it. With all the internet "names"& identities, I'm surprised there isn't one yet. Any plan on making the @ sign? I'm pretty new to stamping . .. but I *love* both of my leaf stamps. And I would really like a cloud stamp. In my head I have a ring with "Dream" on it . . . I think a cloud would be a nice addition. Sometimes it is nice to have our heads in the clouds for a bit - even if only for a mental break from the real world. My favorite is the one on your site that you have titled "*NEW* Basic Flower Face Design Stamp (1/16")". I have the smallest version, and love it. I want to put it on every item I make. I would love a tiny ladybug stamp where the bug's body is in the shape of a heart. I love a lot of the stamps...but my favorites are the swirl heart and the leaf stamps. I get a lot of requests for some sort of Hockey stamp! i'm new to stamping but every order i place, i buy a design stamp! i'm having so much fun everytime my box comes in!!! i love them all!! living in canada, and with 2 of my girls playing...a hockey stamp would be awesome!! think of all the hockey moms that would love that!!! If I could put anything on a stamp I would put have confidence & courage. These are two of my favorite words. I am quite new to stamping, so I do not have too many design stamps yet, but one of my favorites I have seen so far is the ? mark stamp on beaducation..I just love it! reminds me of the riddler from batman! :) a close 2nd is the bird stamp! thanks for all the great products! They are all fabulous but I always go back to my spiral stamps - all the sizes - I love them!!!!!!!!! Dragonflies are always my favorite! The loopy stamp - it is very versatile and can be used everywhere! But I do love the bird stamp and I think I'm going to order it next time!! Ooh, I hope I'm not too late. I've been making jewelry for about five years now, but only just recently started metal stamping, and I'm in love! Since I don't have very many design stamps yet, I am happy to get anything! But I love the bird, it is so versatile. The musical note design stamp has served me well, since so many of my friends and family members are musically inclined! Lately, I've been hoping to find either a violin design stamp or an F-hole (that's the sound hole you see on a stringed instrument, silly!) stamp. A guitar or trumpet stamp would be cool, too. How about a whole set of instrument designs? My current fav (and it changes often!) is the swirly heart. I would LOVE to have a new, super cool dragonfly stamp! I love my martini glass stamp!